Six local professionals will give short presentations on their work at an event planned in downtown Fayetteville this weekend. 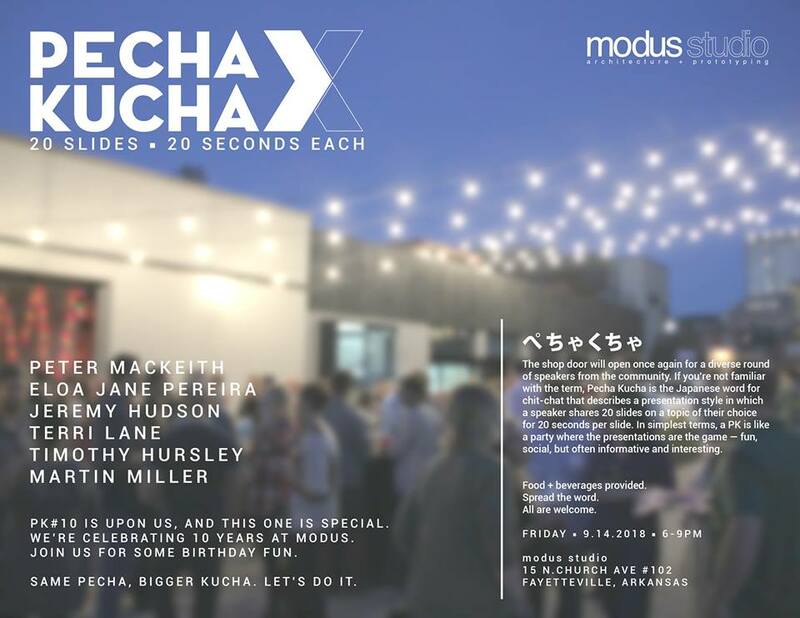 Pecha Kucha 10, organized by local architecture firm Modus Studio, is set for 6-10 p.m. on Friday, Sept. 14. For those who aren’t familiar, Pecha Kucha is a style of presentations created in the early 2000s in Japan where the presenter moves through 20 slides shown for 20 seconds each. The result is a fast-faced presentation designed to allow for multiple speakers to cover a variety of interesting subjects quickly over the course of an evening. This weekend’s event is the 10th such event organized by Modus Studio. Speakers will include Fay Jones School of Architecture dean Peter MacKeith, Brazilian environmental artist Eloa Jane Pereira, Specialized Real Estate CEO Jeremy Hudson, Terri Lane of Northwest Arkansas Land Trust, Little Rock architectural photographer Timothy Hursley, and Martin Miller of TheatreSquared. Food and beverages will also be served at the event. The presentations will take place in the architecture firm’s shop area behind their offices, located at 15 N Church Ave. The event coincides with Startup Junkie’s Startup Crawl, which will also be taking place downtown Friday night. The event is free to attend, and open to the public. Visit the Facebook Event for a bit more info.